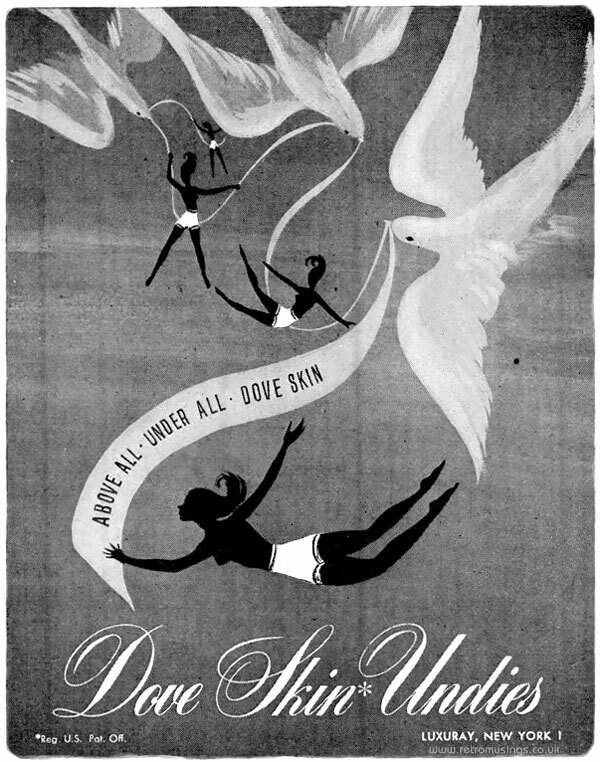 These black & white illustrated ads for Dove Skin Undies by Luxuray are from 1947-48. Woodbury ~ Skin Care Adverts  "Cold Cream"
General Electric ~ Lighting Adverts [1946-1947] "G.E Lamps"
Webcor ~ Hi-Fi Adverts [1956-1958] "Listen Webcor"
Hanes ~ Lingerie Adverts [1965-1967] "The Great Leg"
Lucky Strike [1950-1952] Cigarette Adverts ~ Be Happy-Go Lucky! Pepsi-Cola ~ Soda Adverts [1966-1969] "Pepsi Cold"